John Goedtke faces multiple charges in a hit-and-run crash in Washington County. WASHINGTON COUNTY, Fla. — A Hillsborough County man has been charged with DUI manslaughter after a crash that led to the deaths of three linemen, who had been working to restore power to the Florida Panhandle after Hurricane Michael made landfall. Florida Highway Patrol says all three linemen were struck by John Goedtke, 37, of Thonotosassa, in a hit-and-run crash Wednesday night in Washington County. The victims have been identified as 52-year-old George Cesil, 60-year-old James Ussery and 22-year-old Ryan Barrett. Ussery worked for West Florida Electric Cooperative, while Cesil and Barrett worked for Lee Electric Construction, Inc.
Deputies said Goedtke tried to run away -- but was arrested and taken to the Washington County Jail. 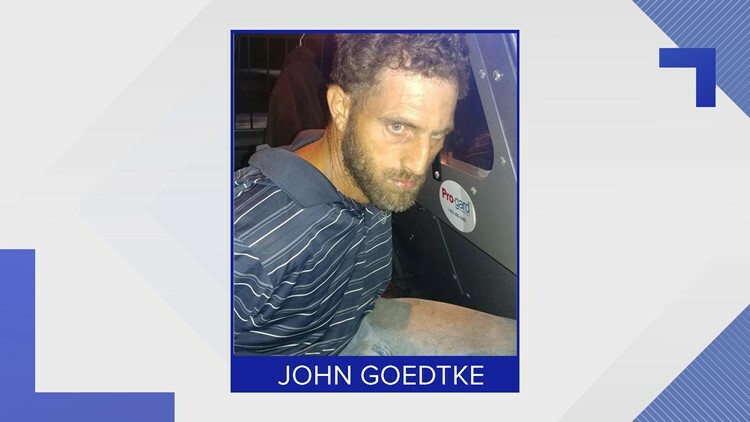 According to Florida Highway Patrol, Goedtke was charged with felony DUI manslaughter, felony vehicular homicide and felony leaving the scene. Authorities say additional charges are pending. Florida Public Service Commissioner Gary F. Clark released a statement mourning the three men and honoring their service. "Following Hurricane Michael, these three men, along with countless others, worked around-the-clock to restore power and return normalcy to the people in areas that were devastated. They will forever be remembered and are the perfect illustration of the dedication of linemen all across the nation." "My heartfelt sympathies are with the families of the deceased and the West Florida Electric Cooperative family as they go through this difficult time," the statement said. Editor's Note: The Florida Highway Patrol – the investigating agency in this case – reported Goedtke is from Thonotosassa. Initially, the Washington County Sheriff’s Office reported he was from Tampa.